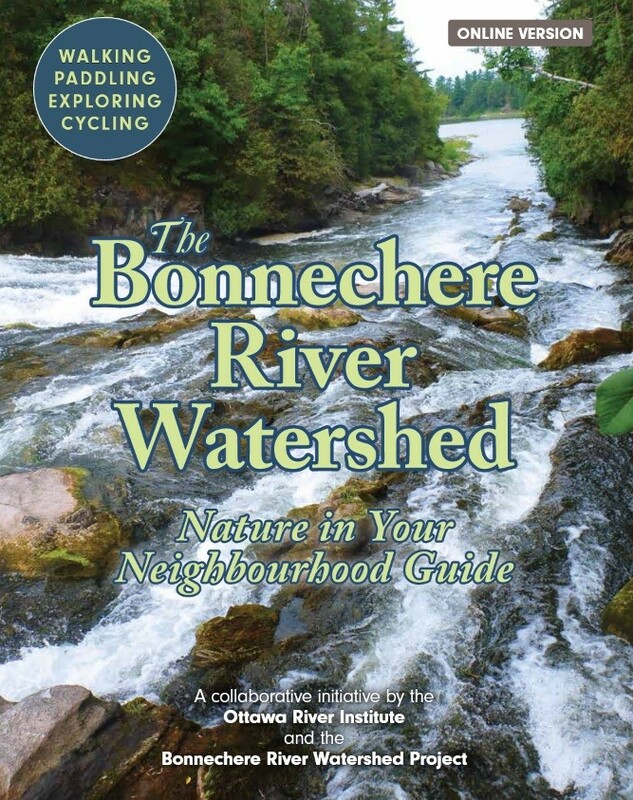 The Bonnechere River Watershed Nature in Your Neighbourhood Guide is a collaborative initiative of the Ottawa River Institute and the Bonnechere River Watershed Project, with funding support from the Ontario Trillium Foundation. We have designed this guide to help you enjoy and appreciate the Bonnechere River watershed and its natural highlights, while offering opportunities for physical activity at the same time. We have provided links to other relevant information, drawing in particular on the Valley Explore portion of the Ottawa Valley Tourist Association web site. We welcome comments and feedback, which can be directed to either sponsoring organization (or http://www.BonnechereRiver.ca ). The Bonnechere River travels 145 km from its source in Algonquin Park to the Ottawa River at Castleford. Its course includes two large lakes and long calm stretches that are interspersed with rapids and waterfalls. Historically, log drivers built wooden chutes around these obstacles. Mills followed and later, hydroelectric dams were built at some of these locations. The term ‘chute’ is still widely used around the Bonnechere to refer to major rapids and waterfalls. In this guide you will see references to ‘chutes’, numbered from the ‘First Chute’ near the mouth of the river, and upriver to the ‘Fifth Chute’ in Eganville.